Flat tip fusion hair extensions is also named flat tip keratin hair extensions, falt tip pre-bonded hair extensions. The pictured flat tip hair extensions is Hera curly natural color Mongolian virgin fusion hair extensions. 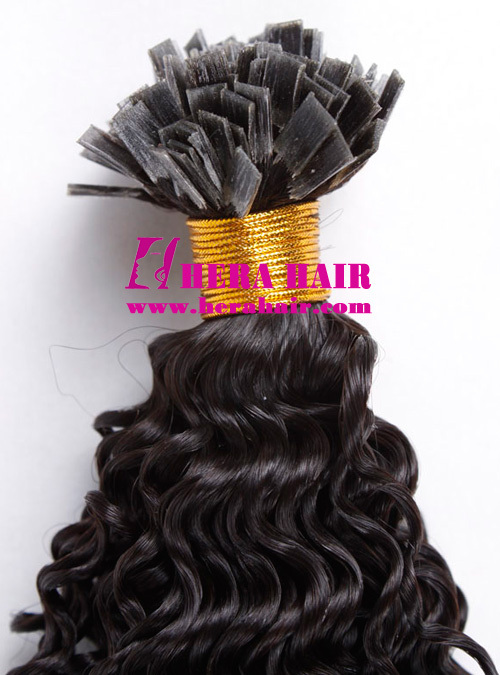 Hera is the best flat tip Mongolian virgin fusion hair extensions wholesaler and supplier in China. Except Mongolian virgn fusion hair extensions, Hera also supply Indian virgin fusion hair extensions, Brazilian virgin fusion hair extensions, Malaysion virgin fusion hair extensions, European virgin fusion hair extensons etc. If you want to do light color flat tip fusion hair extensions, you should choose virgin hair materials, such as Mongolian virgin hair, Brazilian virgin hair and European virgin hair etc are very good choice. Normally speaking, Hera mainly supply 0.9g/strand fusion hair extensions, we also can supply 0.75g/strand and 0.5g/strand flat tip keratin hair extensions (pre-bonded keratin hair extensions). Except flat tip fusion hair extensions, Hera also supply I-tip stick keratin hair extensions, U-tip keratin hair extensions, V-tip keratin hair extensions etc. Personal user buy flat tip fusion hair extensions, you can visit our online store by http://www.herawigs.com, which is free shipping worldwide and you can pay by Paypal.